I was inspired by S. John Ross’s rather excellent recent post on the subject to take another look at Toon. The story behind the writing of Toon is rather famous but bears repeating: Jeff Dee was having a discussion with some fellow games industry buddies, including Greg Costikyan, about whether there were any genres of fiction which you couldn’t feasibly make into a tabletop RPG. 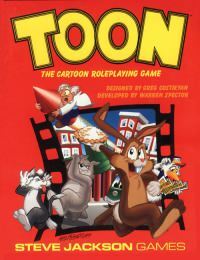 Dee proposed that Looney Tunes-style cartoons would be impossible to translate into a game; a few years later, with a little help from Warren Spector, Costikyan would crack the problem, with the original edition of Toon emerging through Steve Jackson Games in 1984. The original booklet didn’t even hit 70 pages; the most commonly-available version, though, is 1991’s Toon Deluxe Edition, which goes over 200 pages but remains a delightfully light and easy RPG. The Deluxe version incorporates the material from the supplements Toon Silly Stuff, Son of Toon, and Toon Strikes Again. For the most part, the supplemental material simply integrates a few additional optional rules into the core rules text, adds some useful improv resources like a random adventure generator and a collection of funny tables, and introduces the “Cartoon Series” concept (of which more later) – but for the most part, it just adds an enormous number of additional scenarios, so whilst the page count has gone up the core of the system remains delightfully simple and in one book you have both the core game and a remarkably deep well of support material. Costikyan encourages experienced roleplayers to “Forget everything you know” with respect to Toon, and certainly in terms of the system if you apply any rigour to it is pretty slack. It’s a very simple “basic attribute gives you the baseline skill level, skill points can be spent to boost your skill level” character generation process – but because some stats cover many skills and some cover only a few, it’s much easier to play a high-social character by boosting all the social skills than to play a character who does well at all the skills under some of the other stats. In addition, because it’s a “2D6, roll equal to or under the skill level” system, your chances of success won’t go above 50% until you raise your skill level to above 7 – which means that odds are you have to plug a decent number of points into a skill in order to be reliably good at it, and with skills capped at 9 you never really get a chance of success above 83.3%. In a typical game system, this would be pretty miserable and the sample characters offered would be miserably incompetent. For wacky cartoon hijinks, on the other hand, it’s absolutely fine – failure is just another opportunity for something silly to happen. The fact that failure is not something to be afraid of is reiterated by the fact that, of course, your cartoon characters don’t die – they just Fall Down and bounce back within three minutes, just like Wile E. Coyote heals up from those canyon plummets so quickly. There is a saying in RPG circles – I forget whether it originated in tabletop or LARP but frankly it refers to either – that a lot of the time, you have the most fun in an RPG when you “play your character like they’re a stolen car”. I’m not sure that works in every play style – there’s a space out there for very cautious, planning-heavy campaigns, like old-school high-fatality D&D dungeoneering and the like – but certainly it’s an attitude which makes sense in a lot of contexts. In order to do this, you need to let go of the fear of failure – and if you are after an exercise to encourage roleplayers to stop turtling up and allowing worry about negative consequences to their characters paralyse their decision-making, Toon hits the spot. It doesn’t hurt that it’s a great concept for a quick, non-serious pick-up game. That said, its effectiveness lies in part because the sort of cartoons it is based on are cultural touchstones which most people encountering the game could be counted on being familiar with – though I am not sure how true that is any more and suspect it will get less true over time. We’re no longer in a world where cartoons are as synonymous with that old Warner Brothers style as they used to be, and the old slapstick classes have to compete for cultural space with a great many alternatives. I know at least one four year old who has never watched one, and her preferred cartoon viewing has a very different set of underlying tropes. Multiple attempts to relaunch the Looney Tunes roster have rolled out since Toon was published to varying levels of success, and Toon would not reflect them nearly as well as it does the old classics. The Cartoon Series concept in this book seems to be a token attempt to adapt Toon to reflect an ongoing regular series format – one of the examples seems to riff on The Real Ghostbusters, for instance – but I am really not sure it works. Compared to the gleeful anarchy of the old one-shot shorts, cartoon series tend to have a bit more consistency and continuity – not lots, but enough to stop them feeling like the wacky hijinks of Looney Tunes and the like, and in general the underlying tropes and assumptions makes Toon a poor fit for them (especially compared to the likes of Cartoon Action Hour). The Cartoon Series concept feels like an attempt to promote the idea of running Toon as a campaign, which I feel doesn’t really play to the system’s strengths. As such, whilst I think Toon still has it’s place, I suspect we are no longer in a time when people instantaneously “get it” – you can’t just say “it’s the cartoon RPG”, you’d have to specify what sort of cartoon with what sort of sense of humour is involved. Thankfully, if there is one thing Greg Costikyan is a master of, it’s writing rulebook text which instantly conveys the style of a particular game. Paranoia, Star Wars, and Ghostbusters all benefitted from this knack of his, and so does Toon. If the game has any longevity left in it, Costikyan’s prose deserves its share of the credit. Next stop, Greg Costykian’s famous (infamous!?!) _The Price of Freedom: Roleplaying in Occupied America_ where his masterful prose & sense of humor is as much on display even though many critics didn’t see it that way when it first came out.